Scientists May Someday Fight Infertility With 3-D Printed Ovaries : Shots - Health News Researchers printed gelatin scaffolds into which they placed ovarian tissue, and then implanted the new organs in mice. 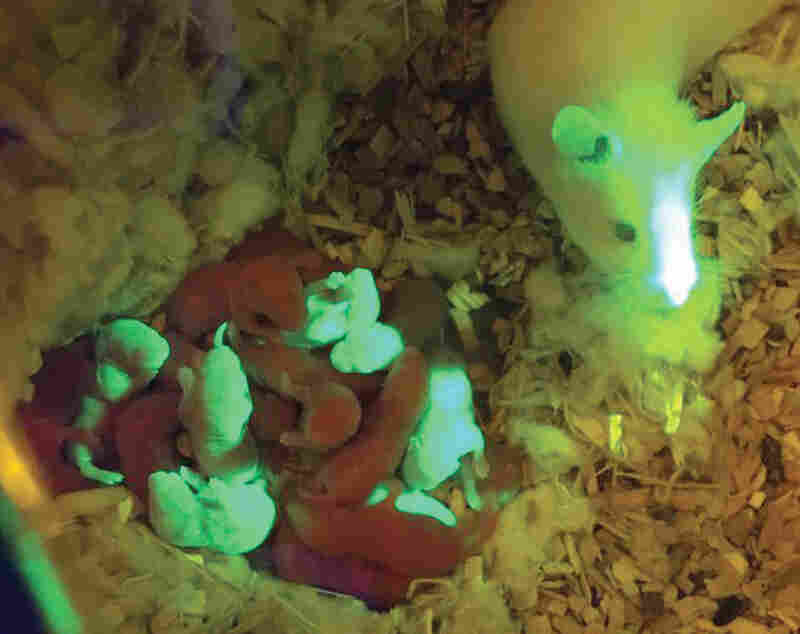 Three out of seven female mice produced healthy offspring using the technology. 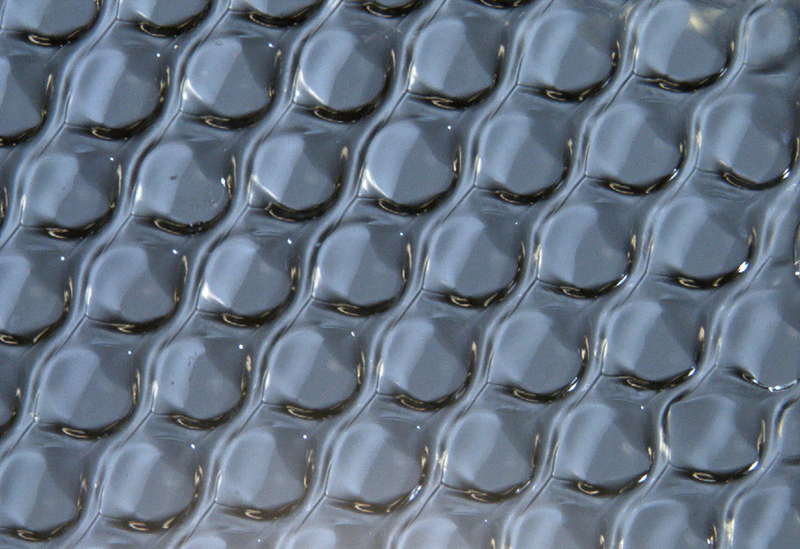 A microscopic view of the gelatin structure used to 3-D print a bioprosthetic mouse ovary implant. The list of things that can be created with 3-D printers keeps getting longer: jewelry, art, guns, food, medical devices and, now, mouse ovaries. "It's really the holy grail of bioengineering for regenerative medicine," says Teresa Woodruff, who led the new research published this week in the journal Nature Communications. The ultimate goal is to create replacement ovaries to restore fertility in women who became sterile after medical treatment, such as cancer chemotherapy, Woodruff says. She hopes to test a human ovary within a few years. For some time now, doctors have been able to restore the fertility of certain cancer patients by removing and freezing some of their ovarian tissue before they undergo chemotherapy and transplanting it back into them later. Some doctors have even tried doing the same thing with entire ovaries. A scientist holds a bioprosthetic mouse ovary made of gelatin with tweezers. But those approaches have shortcomings. The tissue may harbor cancer cells, Woodruff says, and the transplants usually only function for a limited time, depriving the women of the other benefits of a functioning reproductive system, like keeping bones healthy. That's especially challenging for women who lose their fertility as children or young adults, Woodruff says. So Woodruff and her colleagues developed a technique using 3-D printing to reproduce the three-dimensional structures of ovaries that could be used to create "bioprosthetic" versions of the organ. "It's just like the 3-D printers people even have in their homes, but the ink in this case is a biological ink," she says. "It's called gelatin." Gelatin is a naturally occurring substance that helps form the structure of organs. A 3-D printer squirts out gelatin ink in extremely precise patterns, one layer on top of another, to build complex three-dimensional structures modeled on the natural ovary. "We were able to use 3-D printing to actually lay down a scaffold that was copying what we knew the scaffold looked like of the normal ovary," Woodruff says. A male mouse with a litter of mixed pups. Green pups were born from the bioprosthetic ovary. In the mice, the result was a structure about the size of a pea that contains complex formations, including tiny pores, that re-create the environment inside natural ovaries. 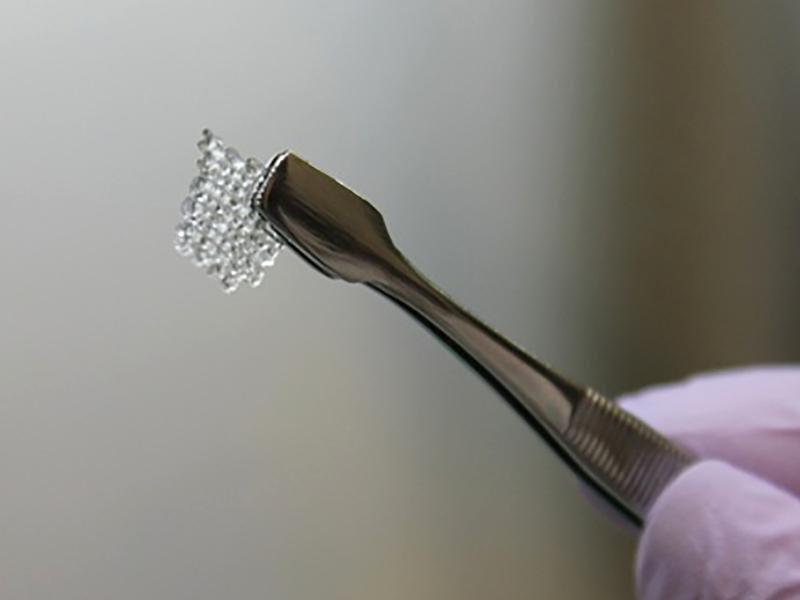 Next, the researchers placed real tissue from mouse ovaries, known as follicles, into the 3-D-printed ovary scaffolds. Follicles contain immature eggs and cells that secrete hormones needed for reproduction and other bodily functions. The researchers then transplanted the devices into sterilized mice. Blood vessels attached themselves to the partially artificial ovaries and began functioning. When the researchers mated seven of the mice, three of them produced two healthy pups each. To use the technology in humans in the future, doctors could remove follicles from a woman before she starts chemotherapy. They would put that tissue into a larger, 3-D-printed ovary scaffold, then transplant the device into the patient when she finishes treatment. "I find this paper very exciting," says Kutluk Oktay, who specializes in fertility restoration at New York Medical College and was not involved in the work. Oktay cautions that much more research is needed to see whether this approach would work in humans. However, he is optimistic. "I think it does open a new avenue in the area of reproductive biology and fertility preservation," Oktay says.